I watched a documentary on food waste and it confirmed what I’ve heard before, most of the food waste, 40% in fact, happens on the home front (gulp!). So I’m hoping this idea to add leftover cooked squash to your next burrito can help to curb the food waste in your household. Now, you might think my kid won’t go for spaghetti squash in their wrap (see recipe below) but you never know until you ask. Stranger things have happened – like a mom I know who discovered her picky eater likes liver pâté. I’m not making that up! If you are new to spaghetti squash you’ll appreciate I’ve started this Spaghetti Squash 4 Ways video with how to cook it. 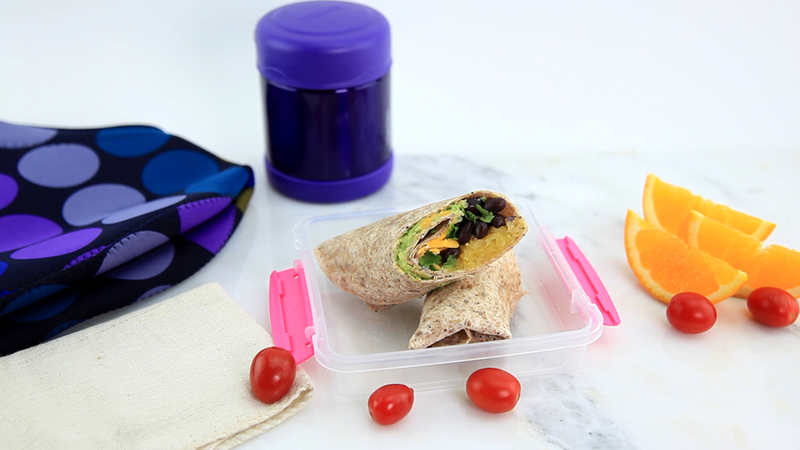 *Kids Cook: Kids are more likely to eat a wrap they have helped to make. On to a large whole-wheat flour tortilla, spread about ¼ cup EACH cooked shredded squash and canned beans (refried or any type you have on hand, rinsed). sour cream and chopped cilantro. • Try swapping out cheddar cheese for Queso Fresco (means “fresh cheese”) a white, salty cheese used in Mexican cooking. • Also try putting all the same elements on to a tostada instead of a whole grain wrap.